For all the significant achievements companies are making as corporate citizens, the issue of their real impact on society – and what as a result society may actually need back from them – raises the question of whether we are adequately defining what is expected by being socially responsible. The issue of marketing to children really brings that into focus; with food marketing a timely lens, the issue of obesity a hot health care crisis, and McDonald’s handling of responsibility, as one of the world’s largest fast food chains, a case in point. 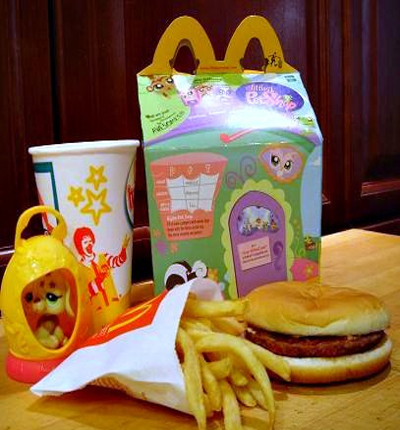 As background, McDonald’s Happy Meals for children with toys has come under attack. San Francisco is one of the cities that has voted to ban selling toys with fast food for children that exceed certain levels of salt, fat, calories and sugar. McDonald’s was accused of deceptive marketing practices to children over the lure of toys as an inducement to buy Happy Meals. Healthy alternatives are available, apple slices in place of fries and milk instead of soda – if kids are willing to eat them. But, there is still the issue of high sodium content in burgers. At McDonald’s May 17, 2011 shareholder meeting, activists focused attention on McDonald’s marketing to children. In February 2011, in anticipation of McDonald’s shareholder meeting, Corporate Accountability International launched a campaign to fire Ronald McDonald, the clown mascot for the last nearly 50 years, and encourage headquarters to stop marketing to children by delivering petitions to individual restaurants. They also asked the chain to address directly the relationship of fast food to obesity. Beginning the campaign in a Portland, Oregon suburb, by May they had gathered 20,000 parents’ and community residents’ signatures on petitions which they delivered to the shareholder meeting. In Oregon, McDonald’s threw down the gauntlet, and affirmed Ronald’s job security, saying he is “the heart and soul of Ronald McDonald House Charities, which lends a helping hand to families in their time of need.” The response demonstrated how McDonald’s infuses the emotional and the marketing: Ronald, the symbol to families dealing with sick and dying children, is also the brand, signifying the food and fun atmosphere to eat it in. A letter signed by 600 health professionals and organizations, critical of the link between fast food and obesity, was read at the shareholder meeting. It had run as full page ads in newspapers across the country. In addition, shareholder Proposal 11, by the Sisters of St. Francis of Philadelphia, requested McDonald’s undertake a report on its “policy responses to public concerns about the linkage of fast food to childhood obesity, diet related diseases and other impacts on children’s health.” The proposal was soundly defeated. Marketing to children, whether the subject is food, toys, clothes or anything else raises enormous concerns for Susan Linn, director and co-founder of a national coalition of health care professionals, educators, parents and others called the Campaign for a Commercial-Free Childhood. “There is no ethical, moral, social, or spiritual justification for targeting children in advertising and marketing, said Linn recently at a Conscious Capitalism Conference. Linn, who also teaches psychiatry at Harvard Medical School, cited obesity and a number of other issues impacting children and society that stem from targeting kids, including youth violence, sexualization, underage drinking and smoking, excessive materialism and the erosion of creativity. The food industry has been effective in limiting the Federal Trade Commission’s ability to regulate marketing to children, and unless Congress changes the rules, companies self-regulate. I asked Linn what protection the Children’s Food and Beverage Initiative provides. Linn indicated it didn’t provide any because it has no actual authority and the standards are voluntary. The Coalition advocates that children be able to develop a healthy relationship to food, but McDonald’s, Linn says, entices kids not because of the food but because of the toys and the message of happiness that is part of their advertising. Marketing to children is inherently deceptive because kids take things literally and media characters play a big role in their lives, Linn says. They don’t understand persuasive intent until they are eight years old; and the brain’s capacity for judgment isn’t developed until their 20s which makes them very vulnerable as marketing targets. Of course parents are accountable for educating their children about responsible choices and healthy foods. And, they have the choice not to take their kids to McDonald’s. Except…if you serve more than 64 million people in 117 countries each day and many of your restaurants are open 24/7, the chain has created a compelling draw. Add to that, a recent report by Yale University’s Rudd Center for Food Policy and Obesity that more fast food marketing dollars for toys are being spent (to get kids in the door) while marketing efforts to promote healthy meals haven’t really increased. PreviousWhat Became of the 2010 Safe Cosmetics Act?